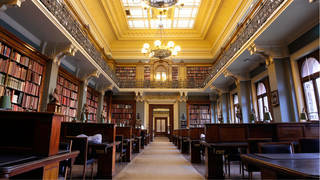 The National Art Library (NAL) is located in beautiful and historic reading rooms overlooking the John Madejski Garden at the V&A. We hold the UK's most comprehensive public reference collection of literature on the fine and decorative arts, including books, journals, exhibition catalogues, auction house sales catalogues, comics, e-resources and much more. Some material, including archives, children's books and Theatre & Performance research collections, is held at our Archive & Library Study Room at Blythe House, near Olympia, London. 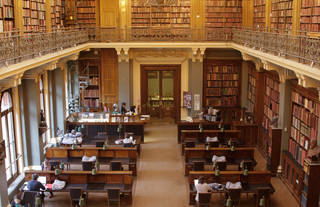 The Library is open to everyone and admission is free. To access its collections and services you need to join the Library. Please leave bags in the cloakroom at the main entrance to the Museum. Food and drink are not permitted in the Library. Find out about access to and facilities for people with disabilities in the National Art Library and our other study rooms. If you are a group involved in researching, studying, working or participating in the arts, you can discover more about the services and collections of the Library through one of our group visit sessions. In addition to the National Art Library, we also have a number of other study rooms, both on- and off-site, where it is possible to view over 2 million objects from the Reference Collections and to conduct private research. To request items to view in the Library and our other study rooms, you will first need to join the Library by creating a user account. This can be done in advance or during your visit. 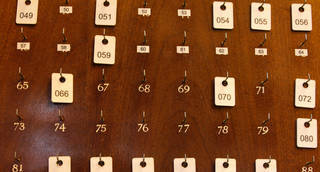 On your first visit to the Library you will need to show current ID (e.g. passport, bank card, National ID card, etc.) and proof of address (e.g. bank statement, utility bill, driving licence, etc. ), in order to complete the joining process and be issued with a Library Card. Search the Library Catalogue to find and request print collections available to view in our study rooms, as well as to discover our e-resources, which include databases, dictionaries, encyclopaedias, e-books and e-journals. Some e-resources are only available to view when you are in our study rooms due to licensing arrangements. You can find information on how to search the Library Catalogue and request material in our guide below. You may also find our list of FAQs useful. All items may only be consulted in the Library and cannot be borrowed. We launched a new Library Catalogue in December 2017. If you have a Library Card that expires before December 2022, you will need to create an account in the new Library Catalogue in order to request books and periodicals from the stores. See our guide on 'How to create a user account' in the Join section above. Please show your Library Card to a member of staff on your next visit to complete the joining process on the new system. We recommend that you request items in advance of your visit to make the most of your time in the Library. Please note that some rare items can only be requested during your visit or are available by appointment – this is indicated in the Library Catalogue. Our staff can help you with questions about our Library collections and services, as well as specific queries related to art and design. 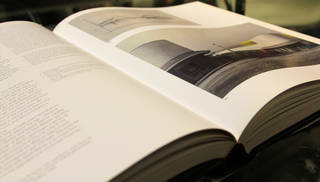 Our Subject Guides on a range of topics, including auction house sale catalogues, artists and the history of the V&A can be found alongside other reading lists in the Course Reserves feature of the library catalogue. Copying is subject to UK copyright law and permitted for private study or non-commercial research. The amount you copy must be ‘fair and justifiable’ and no more than a single chapter or 10% of a total work. You may take photographs using hand-held devices or at the camera stands provided. Please note that flash or use of other artificial light is not permitted in order to protect our collections and avoid disrupting other readers. Please treat all material with great care and make use of the book supports and weights. Ask a member of staff if you need help or advice in handling any item. Book and microform scanners are available and free to use with a USB drive. Bring your own or purchase a USB drive at the Library counter. If you are unable to visit the Library in person, you can order copies online. Anyone copying for commercial research should complete a Copyright Licensing Agency application form. These cost £15 (plus VAT) and are available at the Library counter. For photographs intended for publication, please contact the V&A Images team. We are part of the national Inter-Library Loans (ILL) community, which is committed to the co-operation of libraries in sharing resources. The Library holds around one million books on subjects central to the V&A collections including prints, drawings, paintings, photographs, ceramics and glass, textiles and fashion, furniture, design, metalwork and sculpture. Our rich collections range from medieval manuscripts to contemporary artists' books and armorial bindings to comics and graphic novels. Visit our Blog to keep up-to-date with the latest Library news, exciting new service developments and to discover more about our collections, displays and research projects.